Charlie Hope spent her childhood in Toronto and Boston harmonizing with her sister and in her school choirs. As she grew she discovered the joys of writing music as well, and it became a powerful outlet for her to express her feelings. For Charlie, music should empower not only the creator, but also the listener. Her fresh approach to children's music stems from the many years she has spent with children - from receiving her degree in Art Therapy with Children to the preschools and private homes she has become an integral part of as a trusted caregiver. From all her experiences Charlie believes that music is vital to a child's overall well-being. On her debut album, "I'm Me! ", she created music that is relevant to children's lives; reflecting and respecting their experiences. Elements in the album include a positive take on naptime, learning about the joys of having a new child in the family and discovering the limitless possibilities we all have inside of us. I'm me, I'm me, I'm me"
I also really enjoy "Mr. Sun" because it is upbeat and very catchy. I find myself walking around singing it all the time. There is even a song titled "New Baby" which fits in perfectly here since our new baby is due in less than 2 months (wow). This album also just recently received a silver Parent's Choice Award! As a very nice bonus, the CD packaging is made with all vegetable inks and minimum 10% post-consumer recycled content. Oh and no wasteful plastic case! You can visit Charlie Hope's website to listen to all the tracks from the album, see a listing of upcoming shows and check out some photos and videos. 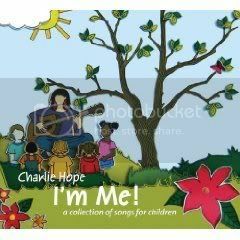 Charlie Hope's "I'm Me!" music CD can be purchased at Amazon.com for $14.95. One (1) reader will win their own autographed copy of the Charlie Hope "I'm Me!" music CD. Visit Charlie Hope's website and listen to some of the tracks. Come back here and tell me which song is your favorite. - Blog about this giveaway with a link to this post and the sponsor. Please leave link in comment. - Follow GreenMamasPad and Charlie Hope on Twitter and and tweet this giveaway. You can tweet once daily. Leave link to tweet in comment. - Add my Green Holiday Gift Guide button to your blog. - Become a fan of Charlie Hope on Facebook. This giveaway is open to US and Canada Residents 18+ only and will end on Friday, November 13th at 11:59pm EST. One winner will be chosen at random using Random.org. Winner has 48 hours to claim his/her prize otherwise a new winner will be picked. You must leave your e-mail address in all of your comment(s) so I can contact you. I will not share your e-mail address with anyone, it will strictly be used to notify you if you win. Good luck! Please note that the opinions and views expressed in this review are my own and based on my personal experience with the company and product. You may encounter a different experience with this product than I did. I did receive the product mentioned above for this review. My favorite song is I'm Me. I think my son would like Blue Balloon the best! My Teddy Bear and Me from World of Dreams! My favorite song is "Dreamland". Very sweet. Please accept my entry. Thank you. definitely the Frog Song! My two year old is standing by me and she loved it! I love the new spin on the frog song and the cowboy boots song is cute. I could see my kids really getting into this cd. I like the song I'm Me. i love the new baby song!! I like the I'm Me song, thanks for the chance!